Good morning! My friends Karen from the Log Cabin Quilter, and Cathy of the Big Lake Quilter are doing such a fun quilt along, with each other! Super fun blocks are being made by each quilter, and the pattern is out of print, so I experimented this morning to see if I could come up with a block that was similar...and of course, my block is different. This was fun, drawing my own pattern!! Today is the last day of November, and the color was brown or black (darks), I think...so I made these birds. I don't know how the yellow one snuck in there! There are all my birdies in the flock, so far. I like these guys!!! I am doing these for the rainbow challenge at Angela's blog...please see here! My patient was not doing well all day yesterday, and coded just before I was to leave. My heart is broken, but we saved them, and I am glad for that! They are now on continuous dialysis and maximum life support. I cannot stop thinking of them and praying for this patient. Such is the life of a nurse! I got home very, very late, and my arms hurt like crazy...I did CPR for twenty minutes. Just a little decor in the middle of the dining room table. Here is the table runner I have for Christmas...I need to make a new one!! 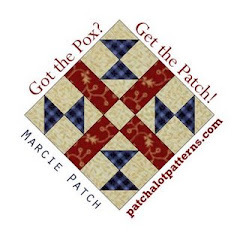 Darling Marcie Patch created this pattern for everyone to enjoy some years ago, and I made a couple of these small quilts. Love this one, Marcie!! You can still get the free pattern; please see below. This was also a quilt along some years ago, with the resulting quilt enjoyed for a long time. "And the greatest of these is Love!" I love that bible verse, and I love this pretty pattern too. I have been wanting to make some stockings for my whole life...so I guess this year is it! An empowering question is, "If not now, when?" If applied to all my life...I would make good progress. I am making Christmas ornaments too...here are a few in progress. This one is the Star in the East. I made these for last year, so I guess I will give them out this year, since I did not get them done...and so it goes!! There are few things that warm a nurse's heart like a very, very ill patient who is well on the way to getting better. I had one such patient recently, snatched from the shadow of death, literally. What a blessing to see them get better!!! What an amazing miracle of God to behold...all these specialties coming together to help heal this person!! So many hard working nurses and docs and therapists worked their guts out to help...I am blessed to work with each one of you! I made a tutorial for the kitty cat blocks I have been making. They are fast and fun to make!! Some pieces are turned differently in the block than I have show up above...I was just showing all the pieces cut out. Here is my little, very professional drawing...giggle! Well maybe not professional, but it worked for me. Here are my cut out pieces. I sewed the ear print pieces to the 4.5 inch strip, using the connector corner method. I sewed two background connector 1.5 inch squares to the head print section. I then sewed two more of the background connector corners to the body print section, as above. I sewed a background square to the 2.5 inch strip of print to form part of the tail. I then sewed the two remaining background squares to the tail strip, to form the long tail. Then I sewed the head together, then added the spacer as above to form the top part of the kitty. The body is also sewn together as above. And then here is the whole block, done!!! Whoop! I have two kitty cats!! I am making twenty for this quilt. I was thinking...I should just do what makes me happy, and what could be better for me than pink!!! So please enjoy and make kitty cats to your hearts desire! Thank you for your patience with my tutorial...hope you make some kitty quilts and please show me too!! Happy Thanksgiving in advance...pie making has been on the agenda today, as I have to work a lot of the holiday...the hospital does not close!! Happy Sunday...and a cherished day off! Good morning!! This is what I am doing for the sashing on my basket quilt...the patterns are free, from Cheri Payne. I decided to just make four baskets, so here is where I am. Applique is super fun!! I have always wanted to make a big quilt from this block...so I made one, just to see...and somehow, I don't like it so much. Maybe it is the fabrics choices I made...so I will wait on this one. As I was cleaning, I found pieces and parts of old quilts, and some of them found their way into this little pink quilt. The nine patches were leftover from a mystery quilt from Bonnie Hunter at Quiltville...who by the way! Has a mystery quilt coming up, if you didn't know!! Please see the link below to check it all out!! I have been saving Christmas fabrics forever. Why? Why am I saving it?? The time is now to move forward with making something!! I cut all the Christmas fabrics scraps into these pieces...and will create, I hope, a lovely Christmas quilt to be enjoyed throughout the season. This was the pile I started with! Yahoo..progress feels amazing!! The final kitty block is done...and I have written instructions, so I am forging ahead with cutting out the whole quilt now. Whoop! I do not want to step on any toes, if this is someone's pattern, but I figured the kitty block out after several block trials. I would love to share the pattern, but do not want to take away anyone's livelihood, if they are selling the pattern. Does anyone know if this is a copy written pattern?? Or is it just one of those patterns that has been around forever? And would anyone be interested in the pattern, just to make your own quilts from?? I mean just to share the pattern, not to sell it...just for us to enjoy together!! I am looking at that closet with the quilt tops all hanging up in a neat row, and those quilts are reproachful and say to me..."Why cannot I, at last, have my border? Why can I not get quilted!!!??" All right, all right, LOL! Since the above quilt top is so, so busy, I just used a plain border...so I just need to cut threads and get it quilted. This is made entirely of scraps...even the border was cut from two pillowcases that were given to me. Same with this quilt...a plain border. Pretty bright, yes?? Closer to getting done!! I am so happy!! It is fall time here, and the vines are failing, but the melon vine is still trying to reproduce. Nature is amazing!!! Hypothermia protocol. This is the process of cooling the patient after a cardiac arrest, in order to help preserve brain function. We have recently had two of these patients, cooled to 90-92 degrees F, and both of them are doing much, much better!!! Hurrah!! Using those strings all up! I have sorted all my strings, which I just am in love with! into colors. I have been playing with brown strings, and have made some log cabin blocks. These are fun and mindless and soothing to make...love that! What if I make the 4 1/4 inch blocks into bigger blocks, then sash them? They finish at 3 3/4 inches, being made of 1 1/4 inch strips. Each of these is a plastic shoebox from Home Depot, with the strings sorted into their colors. This process was fun and time consuming, but I think they are much more usable and fun now, all sorted out!!! After all, the goal is to USE them, not just HAVE them, right??? I would like to do a study on sensory deprivation and confusion and dementia in older patients. I had a 90 year old fellow come in, pretty sick...and was immediately told in report, "He is confused and demented." So, I went in, with lots of eye contact and love and a little stimulation with hand holding and time...and he IS NOT confused! The problem is: He cannot see!! He cannot hear!!! And no one really talks to him! By the way, the golden oldies are my favorite patients of all time. Frank and truth telling and earnest...I love them! I hope each of you is having a great day! Winners! and also some more drafting of cats! So, here is the latest cat block trial. I think I like this kitty better. Do you?? Fatter and somehow better...except the white I used is sooooooo thin. For my quilt blocks, I will use a better fabric quality, but for this mock-up, it was OK to use the scrap of white. This was the original cat I drafted. This one is a alley cat...kinda skinny and scrawny, and in need of a good going over and lots of love! I will finish it into something fun, though! This piece was in some scraps, and it had no letters on it...but I think it must have been "welcome", so I cut out those letters and will applique them on and it will be a finish!! Hurrah!! I had a request for biscuits today, so I made these. Buttermilk biscuits, and they were really quite good! Very simple, and I found the recipe on pinterest. The only thing is...they were really tall and fluffy when I first took them out of the oven, but as they cooled, they fell a bit. Any suggestions? And a cherry pie. It got cut into quite soon after baking, so I did not get an after picture...and it is pretty good too. AND ME ON A LOW CARB DIET...HAHAHAHA!!! I have been working tons, so have not gotten any big projects finished, but lots of sorting and such. And speaking of that, a lady at the quilt store added some crumbs to mine, so I have enough to give away 4 boxes, from last post!! I am keeping just the ones given to me as gifts, that are nestled away in my pretzel bin, because I want to use them all up! Please send me your snail mail addresses, and I will get your crumbs of fabrics to each of you!!! Catting around...now that does not sound very nice, does it??? Just drafting a wee pattern to see if I could do it...the next time will go more smoothly! Great fun!!! And I know how to press it now...everything toward the dark side. I wonder if the addition strip of purple on the bottom is good, or bad...any opinion??? Crumbs, or the story of NOT being a hoarder, LOL! or...are you a crumby quilter??? OK...well as quilters, we love fabric. Tons and lots and big pieces and yardage and itty bitty scraps; it all warms our little hearts. I have been saving crumbs; pieces that are irregular and smaller and not strings (Strings are my secret or not so secret addiction!) into this 3 gallon plastic pretzel bin. I could easily fill another one! I think that I could sew a couple of crumby quilts from this bunch of smaller pieces. 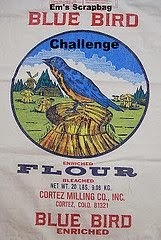 I really want to share some of these crumbs...and not be a hoarder, LOL! These are all from my personal sewing, over the years. So...are you a crumby quilter? I think I would love to give away at least this many crumbs of fabric, to some one. Maybe a newer quilter who does not have a big stash, or someone that just wants to make a crumb quilt!!! If you just comment that you would like some, I can send a box to you, stuffed full of crumbs, and some bigger pieces, too. If there is more than one person, I will have a drawing next week. This is a pretty sweet girl, don't you think?? Rosie is a quilting poodle! Here are some of my found 8 inch blocks laid out. I need a few more for a full quilt...so will keep on stitching! Scraps-R-US! I was cleaning and organizing, and found a whole quilt made of these blocks...rather, I found the cut out pieces, and some blocks already sewn. If you squint your eyes, you can see the light and dark scraps better. This quilt...well, I put a lime green border on it! It came out in the pictures as somewhat garish, but really, it is a pretty green that just screams springtime!! This one is pretty scrappy...hundreds of different fabrics, mostly cut from tiny pieces, not strips. I love that! I found some more 6 inch blocks...it was a start on the Splendid Sampler, but then I went with red, white and blues, instead...so I have more blocks to add to my stack of 6 inch blocks...to someday put in a quilt. I worked on EIGHT quilt tops to get ready for quilting...that mean pressing and cutting threads (I think this is mind numbing), and matching backs to tops. Binding is at the ready...and that was the biggest portion of this day. PROGRESS!! Fully half of these will be patient quilts, so that makes me happy, happy! !